​​​​​​​Welcome to our oil cloth section. They are gloss finished and look very jolly and happy. The Oil Cloth is printed on Non Optic (not brilliant white) heavy weight Half Panama Cotton. It is generally around 140-150 cms wide with the selvedge cut off. It is sold per 1metre at £40.00 p/m. If you want 2.8 or 3.2m ie part of a metre email me. You do get the odd dot and mark and scuff from the process of printing and coating which seems impossible to avoid and i'm afraid it is how it is. I generally send it on a roll and sometimes fold it and usually it is around £13.00 to send 2 or 3 metres. The price is £40.00 per metre. There is no minimum but you will have to phone/ email me if you want part of a metre. Oil cloth will mark with highly coloured things like tomatoes and curry, red wine and lily pollen. I am having a bit of trouble with the delivery settings so email me if there is a problem or if it is coming up too much, too little or free as my technical skills are poor. Mixed flowers on a yellow ground. Large, bright and bold oil cloth with big flowers on a white background. Big bold flowery oil cloth on a cream background. 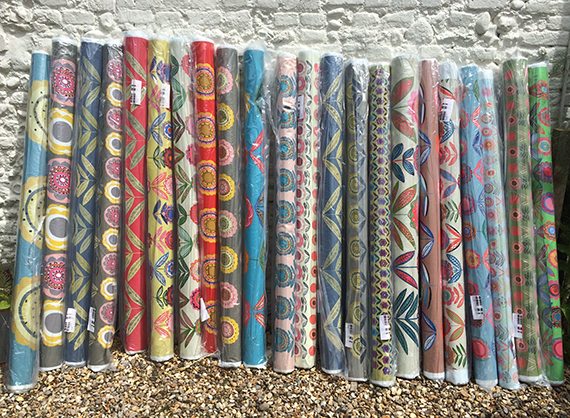 Very big bold bright and original large scale oil cloth. Very happy. 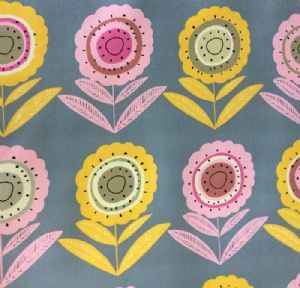 Medium sized pink and yellow flowers on a soft khaki grey background. Leaves in red pink and black and white print.